The federal government raises trillions of dollars in tax revenue each year, though a variety of taxes and fees. Some taxes fund specific government programs, while other taxes fund the government in general. When all taxes for a given year are insufficient to cover all of the government's expenses - which has been the case in 45 out of the last 50 years1 - the U.S. Treasury borrows money to make up the difference. 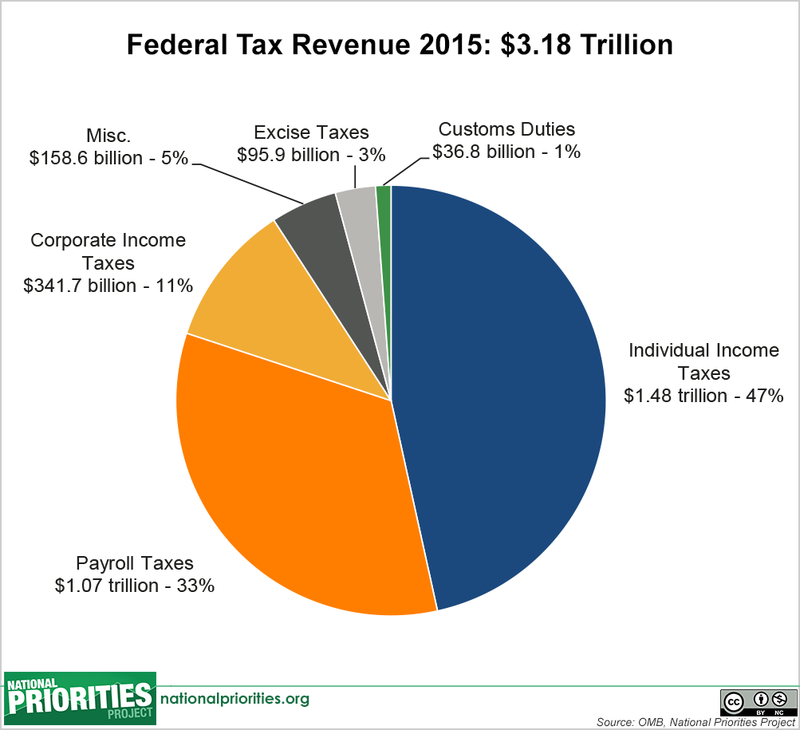 Income taxes paid by individuals: $1.48 trillion, or 47% of all tax revenues. Payroll taxes paid jointly by workers and employers: $1.07 trillion, 34% of all tax revenues. Corporate income taxes paid by businesses: $341.7 billion, or 11% of all tax revenues. There are also a handful of other types of taxes, like customs duties and excise taxes that make up much smaller portions of federal revenue. Customs duties are taxes on imports, paid by the importer, while excise taxes are taxes levied on specific goods, like gasoline. This pie chart below shows how much each of these revenue sources is expected to bring in during fiscal year 2015. Once they are paid into the Treasury, income taxes and corporate taxes are designated as federal funds, while payroll taxes become trust funds. Federal funds are general revenues, meaning Congress and the president can decide to spend them on just about anything when they conduct the annual appropriations process (see our explanation of the federal budget process). Unlike federal funds, trust funds can be used only to pay for specific programs. The vast majority of trust fund revenues pay for Social Security and Medicare. The U.S. Constitution (Article I, Section 8) grants Congress the power to collect taxes. Early federal taxation was mostly in the form of excise taxes on goods such as alcohol and tobacco. Although an income tax existed briefly during the Civil War, it wasn't until 1913, with the ratification of the XVI Amendment to the Constitution, that income taxes became permanent. At that time fewer than 1 percent of people with the highest incomes paid income taxes. Nowadays, more than 100 million American households file a federal tax return each year, and those income taxes make up the federal government's single largest revenue source.3 The income tax system is designed to be progressive. That is, the wealthy are meant to pay a larger percentage of their earnings than middle- or low-income earners. Due to the complexity of the tax code, however, this is not always the way it works out. Corporations pay income taxes similar to those paid by workers. Depending on how much profit a corporation makes, it pays a marginal tax rate anywhere from 15 to 35 percent.4 The top marginal tax rate for corporations, 35 percent, applies to taxable income over $18.3 million. 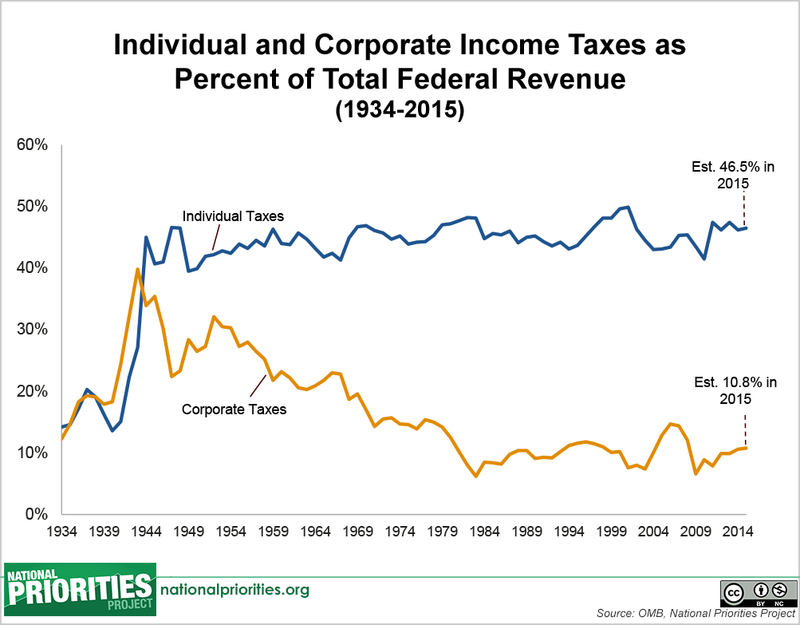 As you can see in the line chart below, individual income taxes make up a much larger share of all federal tax revenues than corporate taxes do, in part because the wages and salaries of all Americans are much larger than profits of all U.S. corporations. The share of federal tax revenue paid by corporations has also declined substantially over time. While individual and corporate income taxes are designated as federal funds, as described above, payroll taxes are designated as trust funds. Trust funds can be used only for very specific purposes - mainly to pay for Social Security and Medicare. Social Security, officially called the Old Age, Survivors, and Disability Insurance program, is meant to ensure that elderly and disabled people do not live in poverty. Medicare is a federal program that provides health care coverage for senior citizens and the disabled. Taxes to finance Social Security were established in 1935 as a payroll deduction - these are the payroll taxes you see taken directly out of your paycheck, labeled on pay stubs as Social Security and Medicare taxes or as "FICA," an abbreviation for the Federal Insurance Contributions Act. That's the law that mandates funding for Social Security by means of a payroll deduction. The deductions from your paycheck are only half the story of payroll taxes. Employees and employers each pay 6.2 percent of wages into Social Security and 1.45 percent into Medicare. That means your employer deducts 7.65 percent of your wages from your paycheck to contribute to those programs, and then your employer contributes an equal amount, though you never see documentation of your employer's contribution. In most years, the federal government spends more money than it takes in from tax revenues. To make up the difference, the Treasury borrows money by issuing bonds. Anyone can buy Treasury bonds, and, in effect, lend money to the Treasury by doing so. In fiscal year 2015, the federal government is expected to borrow $583 billion to make up the difference between $3.18 billion in revenues and $3.8 trillion in spending. Borrowing constitutes a major source of revenue for the federal government. Down the road, however, the Treasury must pay back the money it has borrowed, and pay interest as well. In 2015, the federal government will pay $229 billion in interest on the national debt. For more on this topic, see Federal Budget 101: Borrowing and the Federal Debt. Office of Management and Budget, President's Budget for Fiscal Year 2016, Budget Authority. Internal Revenue Service, "Data Book 2014"
Internal Revenue Service, "Publication 542: Corporations," 14 Nov. 2013. Citizens for Tax Justice, "The Sorry State of Corporate Taxes," February 2014.